Can money be holy? Find out three ways it can. We have a historically thorny relationship with money in the church. We need it to live and we need it for ministry. And we are little afraid of it. We feel like money is a little tainted. There’s no doubt that money can be tempting, as the story of Judas shows. Jesus spoke about it so much because he knew it was important to develop it spiritually and work on our relationship with it. And yet: can Christians, who have a theology of incarnation, step away from dualism? Can we see ways that money can be baptized and become holy? to care for God’s creation. I remember riding the bus regularly when we first got to Portland. Karl was driving an hour to work, and we only had one car. I asked myself, “What would Jesus drive?” (Remember this was the early 2000s.) I decided Jesus would take the bus, or be driven around in a Mercedes by one of his wealthy friends, like those women who supported his ministry. In fact, I had a friend with a Mercedes who would sometimes give me rides. She was sharing her resources with me at a time I really needed it. It was a blessed, if difficult, time. I have a car of my own now. And of course, there are many, many people in my city, in this country and in the world who will never own a car: Some by choice (this is Portland, after all), and some because they cannot afford it. I always want to remember how wealthy I am (and was, even then), by global standards. When I’ve been surprised by God’s provision when I didn’t think there would be enough. When I can take care of myself and my family. When I can give it away to support work I believe in (through giving and through payment). When I have the opportunity to do work I’m called to and receive payment for it. When money has come in for ministries I lead (and when my own salary has been paid by the generous gifts of others). If we view money with the potential to be holy then we can be in a different relationship with it. 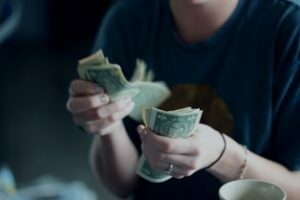 Instead of the fear and anxiety and greed and longing (all of which I have felt), we can gratefully appreciate the flow of money into and out of our lives. We can allow more of it to flow outward to others, according to our resources. How has money been holy in your life? Thank you. I’ve forwarded it to our Moderator. Hopefully, she will share it with Council. We are starting to plan for a capital campaign to complete renovation on our church after it was nearly destroyed by fire. Joyce, you are welcome! Blessings on your rebuilding campaign.